Cities Connection Project | BADENERSTRASSE 380. ZURICH. The building spans the entire parcel between Badenerstrasse and the new Hardau Stadtpark (city park). Its orientation toward these two public spaces is strengthened by the shaping of the two visually striking main façades. Along Badenerstrasse, the street alignment is closed, and the vertical articulation – i.e. the volumes that rise from the continuous ground story – adopts the rhythm of a typical “jutty” building. A simple, uniform structure that remains invariable through all stories renders the construction process economical. The ground floor level is executed as a retaining basin in site-mixed concrete in order to offer the supermarket a maximally column-free sales area. Constructed on top of this in a prefabricated timber element construction is the six-story residential section. The point of departure for the design was apartments that take up the building’s entire depth and are oriented toward the south as well as toward the park. For the predominantly single and two-person households, as well as for small families, an open living concept was ideal. 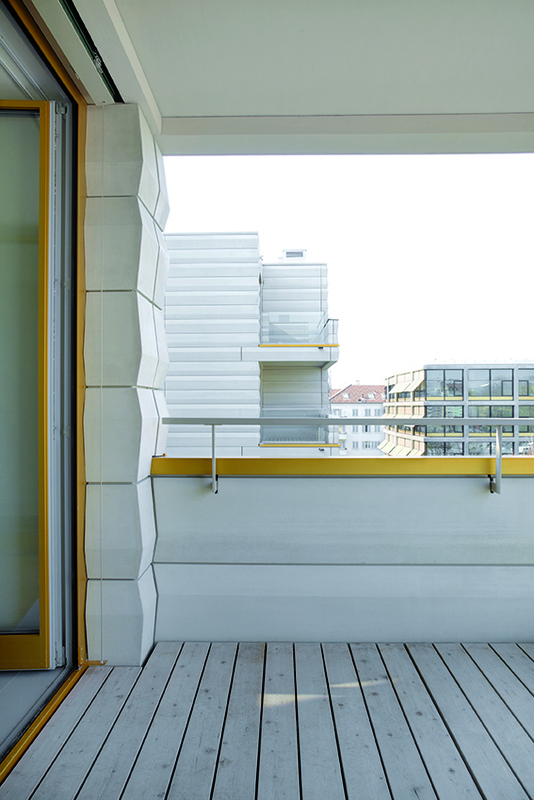 Uninterrupted view axes produce an open, expansive spatial feel while nonetheless allowing zoning into individual residential areas. The project was developed in a consistent way according to the criteria of the 2000-Watt Society. 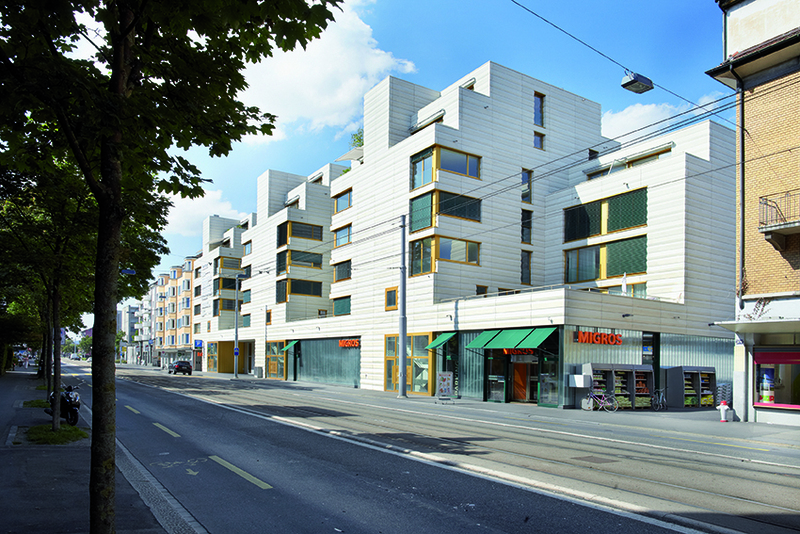 It is the first building in Switzerland that fulfills the high standards targeted by the new municipal legislation. Since the large solid wood transverse sections can be dismantled and be used as raw material for other high-quality products, it is not only a contribution to sustainable building methods, but also a response to the question of a long-term reusability of buildings.